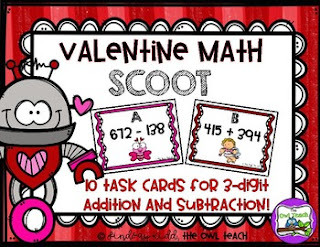 This Valentine Math game is perfect for adding and subtracting 3-digit numbers through 1,000. There are 10 task cards (5 addition and 5 subtraction) to help your students practice addition and subtraction of 3-digit numbers. The set also includes a recording sheet and answer key.